Hardy's Lagoon- Great Barrier Reef - Whitsundays, Australia. This seventh natural wonder of the world is home to 1500 species of fish and over 400 coral types. 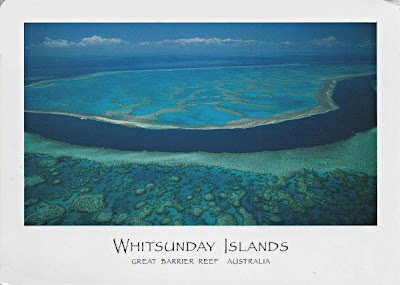 Whitsunday Islands were named because Captain Cook thought they were discovered on Whit Sunday. In fact he was wrong and they really ought to be Whitmonday Islands. I chose this card for today because it's bright and cheerful whereas the morning was raining and dull. The magic has worked and the sun has come out. The Great Barrier Reef can be seen clearly from aircraft flying above the area and from space, larger even than the Great Wall of China. It is the world's largest reef system and lies off the Queensland coast of Australia. The card was sent by someone on a 65-day round the world cruise, which apparently started in San Francisco and due to finish in Rome, via Hawaii, Pango Pango, Samoa, New Zealand and Australia. I have another card (different sender) from the same group of islands, South Molle Island. Gorgeous. There will be people in the states want to be in Australia as the cold weather marches in! Happy PFF! What a great colours! This must be paradise.